美國 HTC One A9 有 Nougat 升級! 全新 One A9s 會在 9月1日 IFA 前亮相?! 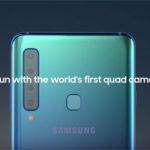 Samsung Galaxy A9 Pro 規格, 6吋屏幕, 4GB RAM?